"Creating healthy shorkie puppies one generation at a time!" Inbreeding is the mating together of closely related dogs, for example mother/son, father/daughter and sibling/sibling matings. For breeders, it is a useful way of fixing traits in a breed - the pedigrees of some exhibition dogs show that many of their forebears are closely related. For example, there is a famous Dog to date regsitered by the AKC and show as top dogs with many championships in the pedigrees. sometimes several times in a single pedigree, as breeders are anxious to make their lines more typey. Superb specimens are always much sought after for stud services or offspring (unless they have already been neutered!) having won the approval of show judges. OKAY NOW LETS REALLY SEE WHAT IS GOING ON HERE! Breeders are intentionally inbreeding to get a "look" a type they are after. But My question is at what expense? It is great that they are achieving a LOOK but what about the hidden problems that are being doubled up on by inbreeding. Such as liver , heart and eye problems and many more that are proven to be genetic. Why is it the AKC does not require genetic testing when a litter is inbred to assess that issue. Puppy parents today are so fearful of inbred puppies that this is a huge reason they have looked for a healthy alternative in mix breed puppies. The gene pool is completely diluted from a mixed breed litter and the chances of inheriting any genetic problems are cut way down. However I do believe that genetic testing is important for mix breed dogs as well to ensure healthy happy puppies. This is not to say that there are not great AKC purebred breeders out there that do not inbreed. Just do your research and ask them about there position on it. Shorkie Club Of America so we will be able to keep an accurate and true record of lineage to ensure we never have shorkies that are produced from second or third generations that are in any way related. That is very very important to us. We are the only shorkie group dedicated to the ethical development and establishment of this Mixed breed. If you see any of this information on any other sites it has been taken from us. Please check to see the about the breeders we work with. We get asked all the times are Shorkies good for children. The answer is Yes! Shorkies are are affectionate, friendly and trusting toward everyone and love children. But it is important parents supervise their children and teach them to be kind and gentle with a new puppy. Shorkie puppies have become so popular that they are now showing up in Pet Stores Puppy Mills all over the USA. 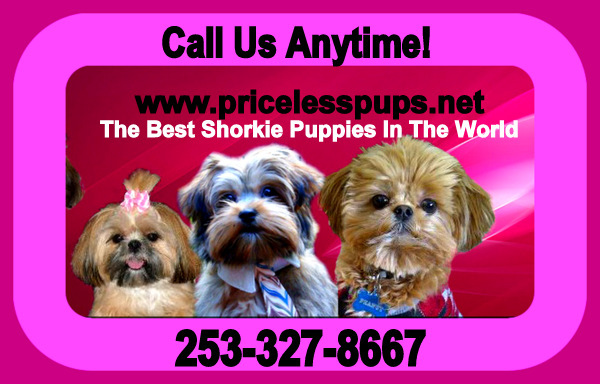 We get tons of calls from unsuspecting puppy parents that having health issues with the shorkie puppy they got from a puppy mill or pet store. JUST SAY NO! do your research and find an ethical breeder!!! © 2015 Pricelesspups.net. All rights reserved.